So this is my farewell post to everyone that I've worked with this summer. All my coworkers, bosses, and the children that came out to the Islands with me have made this one of the best jobs I've ever had. From work outings to Cirque du Soleil and giant capture the flag games on Georges Island, I feel lucky to have gotten to work with a bunch of exceptionally nice, helpful, and funny people. 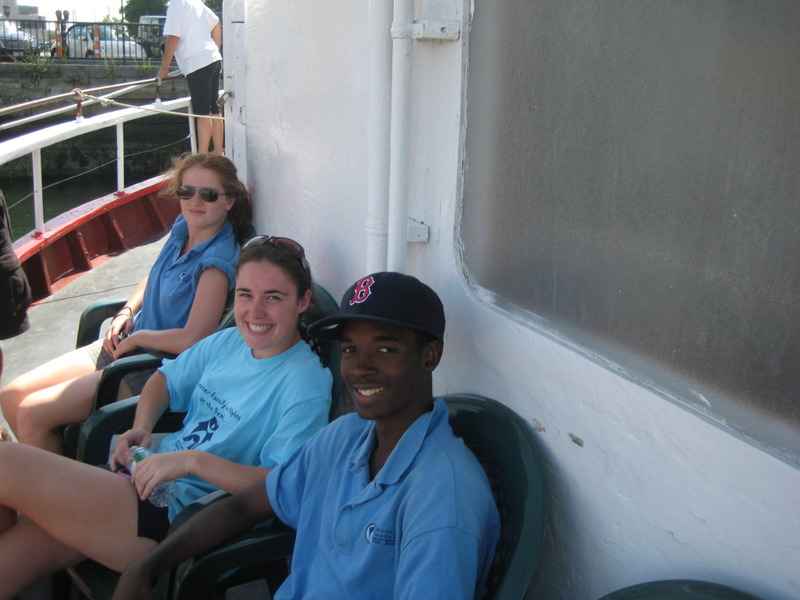 It's a lot easier to get up and go to work in the morning if you know that you're going to be surrounded by people who love what they do, and at STH/STB, everyone is 100% committed to teaching children about how awesome the Boston Harbor is. I also feel very fortunate to have spent time with so many great kids this summer. They could always put a smile on my face because they were so eager to ask questions and go ex ploring, never complaining if it was hot or if they had to follow instructions. Working with kids has been a great experience for me; I now know that I really enjoy working with children and want to continue to do so in the future. So although this is my last post of the summer, I hope it won't be my last post ever. Next summer I hope to be back on the Virginia C II, heading out to fly kites and look for sea glass on Spectacle Island with a whole new group of excited Bostonians. Til next summer! My grandfather has always said that do what you love, and if you're good at it, you'll just happen to get paid. That was his advice for pursuing things in the professional world. He is the epitome of that phrase: at 83, he still gets up every day and heads to a local brokerage firm in downtown Worcester where he works with two of his grandchildren. This summer was my version of that philosophy. There was no dread or negative involved in my summer employment. I was working outside on the water providing inner city kids with opportunities that they had never had. You can not put a price tag on such an experience-- one that I am proud to have in my rear-view mirror as I begin my sophomore year in college. I applaud SHSB and the people who collectively make it possible. The lobster traps have all been pulled up, the fishing rods are all de-hooked, the sailing centers are empty, and the incredible co-workers that surrounded me all summer are heading back to school. It's bittersweet, for sure, as all goodbyes tend to be. But my overwhelming feelings, even as I said goodbye to BJ before he left for his first year of college, and even as Conor and I painstakingly organized all of our equipment for its winter hibernation, are of contentment and joy. Why? Because with the end of the youth programs comes the end of my first summer as a Bostonian, which is actually not an ending at all, but a joyful beginning. I consider this summer my own personal success story of setting out on my own and finding a place where I belong. It's such an amazing feeling to know for certain that this was what I was supposed to do, and where I was meant to be, for the last 9 weeks. And while you might even argue that no one who has lived here less than three months is allowed to refer to herself as a Bostonian, I'm going to have to disagree. Try moving here in the gorgeous summer weather and immersing yourself in everything the city has to offer. Eat new types of food, see Shakespeare on the Common, watch the 4th of July fireworks against the city skyline. Try working in the Seaport district, Charlestown, Quincy, East Boston, Dorchester, South Boston, and on the Harbor Islands-- and learning the bus, train, car, and boat routes between them all. But most importantly, try being in touch with the city's natural environment, and sharing it with the city's next generation, every single day. Then tell me you're not in love with this city. Tell me you wouldn't feel like a true Bostonian, too. Thank you to everyone who welcomed me to this new home: Lindsay and Jen, thank you for your constant support and guidance. Bruce and Patty, thank you for the opportunity to be a part of our organization's amazing efforts and of this amazing group of people specifically. To my coworkers-- I've said this before, I've learned so much from you this summer -- not only about things like music and movies and frisbee, but about strength and selflessness and passion. Thank you for that. And to the children of Boston that crowded the beaches, docks, sailing centers, and boats this summer-- thank you for reminding me of the wonder only a child can possess, and for helping me discover that I want to make education a part of my life for many years to come. You were the reason we got up so early, sweated through the hot days, and shivered through the downpours... so that you could be the next generation of Harbor stewards. Thank you for exploring the Harbor with us. I am sad to see the seasons changing and the youth programs ending, but I am grateful for the gifts this summer has given me. Surrounded by a network of both old and new friends, anxiously awaiting my move into my new Cambridge apartment on September 1st, and guided by a phenomenal summer's memories, I see a long love affair with Boston, and its Harbor, stretched out before me. Hope to see you all again along the way. Continuing with my recent science theme, I’m going to liken my summer to a scientific experiment. It all began with an observation that I made while considering places to move to after graduation: Boston is a vibrant and diverse city, full of passionate people, with unparalleled access to nature and outdoor recreation. My hypothesis? That Boston must contain excellent opportunities to foster connections between citizens and their environment. Results: success greater than I could have ever imagined! This summer, my great post-graduation experiment with “real life,” has been an incredible experience—and I couldn’t possibly thank everyone who made this possible enough. During our first week of training, I set some lofty goals for myself. I wanted to, for instance, learn how to catch a fish—something I had never done before. Moreover, I wanted to teach someone else how to catch their first fish, and witness the surprise and excitement on his or her face as they pulled their prized catch up from the deep. I had no idea, at the beginning of the summer, that helping Boston youths catch their first fish would almost become routine by mid-summer (which isn’t to say that it became any less enjoyable to see). After weeks of driving in tangled circles, I’ve learned how to navigate the communities that surround Boston Harbor, an achievement in and of itself for a non-native Bostonian. More important, however, are the conversations I’ve had with the kids, and adults, who make this city’s neighborhoods the lively centers that I’ve come to know and love. Boston grew up around its harbor, from its early days as a remote colony to its ascendance as a commercial and creative capital. I’m glad to see this city turning its gaze back towards the waters that sustain it, and I’m confident that programs like Boston Harbor Explorers will continue to strengthen the relationship Bostonians share with this natural wonder. 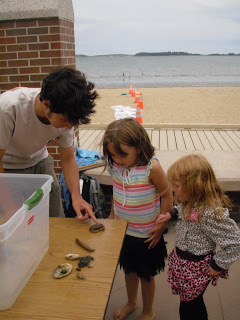 Citizen Science is a concept that repeatedly comes up in the posts on this blog—whether we’re making ecological observations by counting crabs or testing water quality with Secchi disks, we Boston Harbor Explorers use our firsthand contact with the Harbor to gather important data. While we do provide the data we collect to Dr. Judy Pederson and her colleagues at MIT’s Sea Grant Program, there are some even larger and more ambitious programs out there that aim to collect and compare data collected by Citizen Scientists across the nation and around the world. Project NaGISA, which stands for Natural Geography In Shore Areas, is a worldwide research collaboration that takes a census of life along the coastline at 240 sampling sites in 28 different countries. Camp Harbor View is one of those 240 locations, and last Tuesday I had the pleasure of participating in their data collection firsthand. In order to compare data collected at sites scattered across the globe, Project NaGISA has a rigorous set of standardized procedures. Greg Stoddard, Camp Harbor View’s Director of Operations, oversaw a group of Counselors-In-Training as they undertook this scientific survey to fulfill their project requirements. Staff from the New England Aquarium provided the CITs with GPS units, to record precise latitude and longitude measurements for each one-meter-square quadrat, and sections of PVC piping to mark off the habitat areas where we collected data. After assembling our equipment, we headed to the rocky coast to see what living and non-living features we could identify. Racing against the rising tides, we collected data from low, medium, and high tidal zones—providing a detailed, multi-faceted description of life along Long Island’s shoreline. Counselors and CITs alike wore expressions of intense concentration as they scrutinized each quadrat, carefully recording their observations. Project NaGISA provided scientists around the world with detailed data on the coastal geography of our very own Boston Harbor, from the perspective of Long Island. 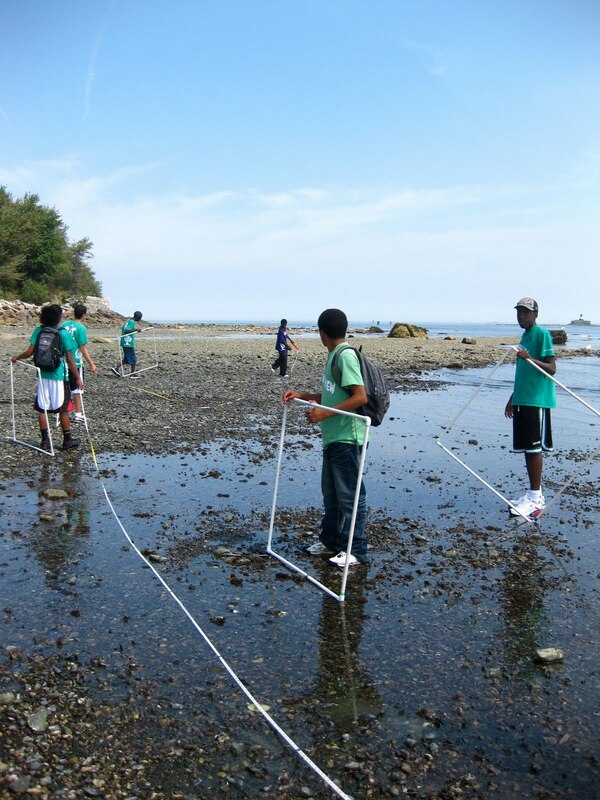 In addition, the research process gave the young adults working at Camp Harbor View a glimpse of the rigors of field ecology, introducing them to a field that’s becoming increasingly important in our changing world. Science is all about collaboration, and I’m thrilled to have been a part of this endeavor. For the two weeks I worked there, Piers Park Sailing Center in East Boston was beset by a plague—hordes of microscopic plants and animals swarmed so thickly through the water column that they noticeably reduced the water’s clarity. Emily told me that the previous week’s Secchi depth reading, a measure of water clarity, had been 3.5 to 4 meters; during the weeks I was at Piers Park, Secchi depth never exceeded 3.5 meters, and most often hovered around 3.0 meters. Half a meter might not seem like such a drastic reduction in visibility, but many algae blooms occur in the few meters below the water’s surface. The drop in Secchi depth that we observed could indicate increased concentrations of algae in the Harbor. While happy to have been able to observe such a far-reaching process in the Boston Harbor, neither our HarborExplorers nor I were happy about our hypothetical algae bloom. Algae blooms, however, do more than just make it more difficult to see into the Harbor’s depths. Depending on the species of algae, algae blooms impart water with a slimy green or sickly, reddish-brown tinge. Blooms are unattractive and gross, even to an untrained observer. Some species of dinoflagellate algae produce toxic compounds, poisoning fish and making shellfish unsafe to eat. Fortunately, we have no evidence to suggest that the algae we observed were toxic enough to kill fish; they did, however, make the water unappealing enough to keep the fish from venturing close to our dock. Fishing in algae-infested water is pretty frustrating! Even using sea worms as bait, we only caught tiny butterfish. Algal blooms occur when large amounts of nutrients enter the Boston Harbor, usually following a large storm. Nitrogen and phosphorous, two essential nutrients that allow algae to proliferate, wash into the harbor when rainwater dissolves fertilizers and other compounds. During extreme storms, some nutrient-containing waste enters the harbor through leaky sewer lines and combined sewage overflow pipes. Nutrient pollution in the harbor isn’t nearly as severe a problem as it was before the harbor was cleaned up, but there are still measures we can take to ensure that nutrient contamination in the harbor is kept to a minimum. Lawn fertilizers, for instance, contain exactly the mix of elements that algae need to bloom—keeping their use to a minimum, or stopping their use altogether, reduces the risk that they’ll end up polluting our harbor. The Boston Harbor is a delicate system that human activity can easily disturb. Without human intervention, nitrogen and phosphorous move through living things in a complex and interconnected cycle. Even unintentional actions that humans undertake on land can have far-reaching consequences for marine ecosystems, and algal blooms are just one of the unpleasant side effects of our careless mistakes. I can only hope that in every year to come Boston Harbor Explorers experience a harbor that’s even cleaner than it was the year before. Thank you to Save the Harbor Save the Bay for helping support our television commercial for the Endless Summer Waterfront Festival on Sat Sept 25th. im sad to say that this summer has come to a stop, i wouldnt say an end because theres still next summer, but as of right now the summer is over. this was my first year working with Save the Harbor/ Save the Bay, and this was the best summer honestly. this summer i did a lot of things that i could never even imagine doing. not only was this a summer of first but it was also a summer where i set goals and actually achieved them in a timely manner. when i first started this job me co workers and i all set goals. my three goals were to have fun, develope relationships with my co workers, learne new ways to interact with children, and to learn something new each day. all my goals i was able to achieve. everyday day at work was full of fun, and everyday i learned something new even if it was just a little fact about the marine life or if it was the story of one of the kids life that i taught, either way everyday for me was very eventful, and knowlegable. everyday at this job was a new adventure.this summer was a summer that i will always remember even when im old and gray. this summer has set a high bar for the next summers to come. staff day i must say was one the most memorable days. during staff day my co workers and i had a day to really just bond. staff day gave us a chance to talk and be our self off the field. during staff day we played an intense game of capture the flag. we also had a nice cookout on Bruce and Pattie's boat. after the cookout we got down to business i should say. we explored the treasures of spectacle island. we walked along the beach exploring and looking at everything we could find. 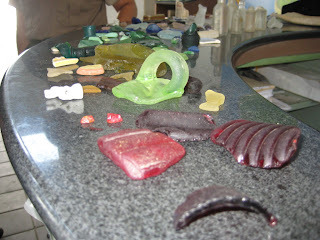 we actually found some cool glass and other things i couldnt even image we would find like sea glass mables. staff day would be a day that i remember forever. 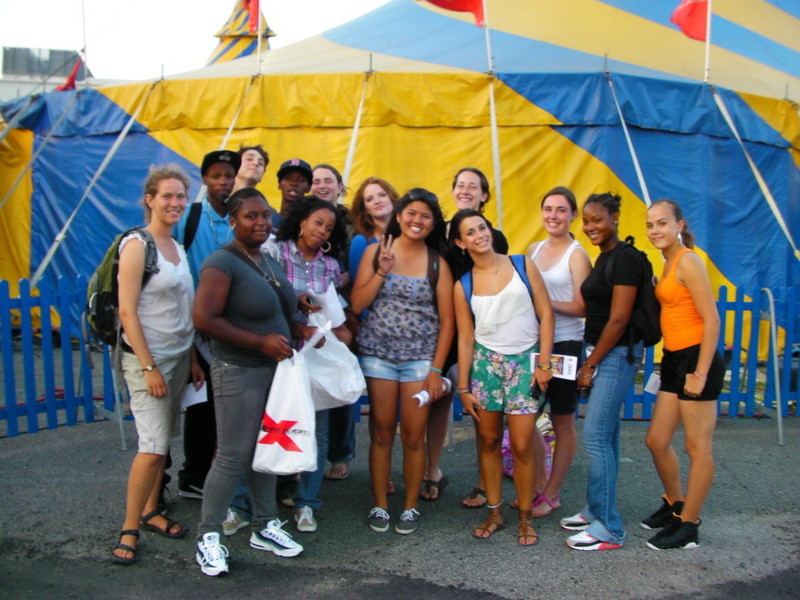 Unfortunately, now that summer is coming to a close so is Save the Harbor's youth program. After working the program last summer, I did not think that it could be improved but I had too good a summer this year to compare to any other. The addition of the beaches events was great; I played (and won) my first ever game of volleyball in Quincy at Wollaston Beach. 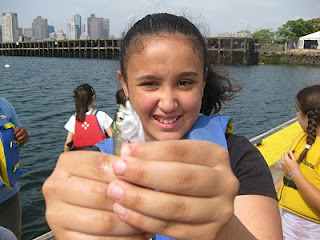 I also caught my first fish (a cunner) of my Save the Harbor career this summer at the Children's Museum. I will never forget the day we caught 18 fish there, one of which we miraculously pulled up with the crab trap. The best piece of the summer pie was all the people though. Boston seems to be filled with the most enthusiastic and interesting kids. I barely had to do any work; they did the job for me. It was not only the kids who enhanced my summer work; I was lucky enough to be with some fantastic co-workers. By the end of the summer I was able to work with everyone, including some of our office staff and I can vouch for all of them, no matter what I happen to be attesting to. Just like the kids, they just made my job easier. I really appreciate everything you all did for and with me this summer. Just for this summer I hope. This past Friday was our last day of work for summer 2010, and I was sad to see everyone go. 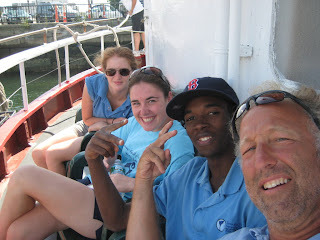 I had a blast working with everyone at Save the Harbor, from the senior marine educators to the interns. I made some great new friends and gained a lot of valuable experience this summer. I wis everyone from Save the Harbor a fun and successful rest of the year. Hope to see you all again next summer. It's that time--seven weeks flew by so fast, I'm writing this from my desk up at school, taking a quick break from outdoor leadership training, which I jumped right into--the day after I finished Harbor Explorers. I'm falling back into my island routine here, waking up early to jump off the dock into the Atlantic! 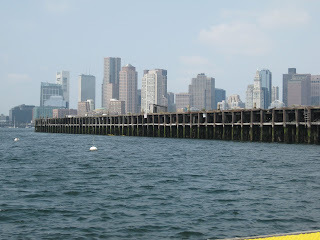 But I have to say I miss the bustle of the Boston Harbor: the days at castle island where we were among hundreds, if not thousands of harbor-enthusiasts, walking, biking, swimming, crabbing--all enjoying the resource together, getting refreshed by the water, and building on the collective excitement of hundreds of people sharing one special place. I am happy to be back, among my marine bio-cohorts--but I'm returning with a renewed sense of wonder that I think I contracted from the kids we worked with this summer. After I finish this post I need to sit down and try to hammer out a senior project proposal--which of course has me thinking about all the issues I've worked on these past three years: climate change, hunger--the list goes on... It's a little overwhelming to think about tackling any one of these. But having spent a summer working on and in a success story like the Boston Harbor--a place where communities really came together, employed national legislation and local passion to protect our planet and support our neighborhoods--has reminded me again of Margaret Mead's truism: "never doubt that a small group of thoughtful and committed citizens can change the word; indeed, it is the only thing that ever had," and inspired me to keep on working, even when it looks like the odds are against us. I want to thank everyone who made this possible: Jen, Lindsay, Bruce, Patty, everyone else in the office, our tremendous staff, all our partners, and most of all the kids I got to spend my summer with. I have learned so much from all of you. In parting, I'd like to offering you a few images of my summer--pictures of what the natural world really has to offer us, if only we'll do our best to pick up after ourselves, and teach our children to do the same. "Hey, we found a really big snail!" To quote my good buddy Julian Casablancas from the Strokes, "The End has no End." Now, I have been working at Save the Harbor/Save the Bay for two summers now and it has been great. So despite not knowing what I am doing next year, I know that my time with the organization its not entirely over no matter what path I choose. I have made countless friends that I know will be with me forever, stored away thousands of memories of spending time with the hundreds of kids I've taught and played with, and I have sunburns on my hands that will undoubtedly never heal. This summer is definitely going to remain with me. I would like to thank everyone for the wicked fun summer! Thank you Patty and Bruce for giving me the opportunity to return for another fun year. Thanks Lindsay and Jen for being supportative and making sure I did my best work. And a big thanks to all my coworkers who were very helpful and made sure things were a blast. I thoroughly enjoyed all the sites and the beach events where I worked. This definetley makes me want to remain apart of the clean beaches effort and active in the Boston Harbor community. I would say goodbye but I'm sure I'll see everyone again someday. This has been a summer of firsts. This was my first summer on my own, my first summer without my family to lean on, without my house and my hometown, my first summer in Boston, my first time having to supermarket shop for myself, my first time on Spectacle Island, my first time seeing a crab, my first time seeing the Boston Harbor, my first time on a real boat, my first press release, my first internship. Though this summer has been filled with ups and downs, for example, one of the downs trying to "cart" a full shop at Star Market on a bike and ending with a crushed glass container of salsa everywhere and a very crushed me. But, it also has been filled with many ups. I've gotten to meet a group of amazing peers from around Boston that have taught me more then they probably know. I've learned the geography of Boston, the neighborhoods, the Harbor Islands, and the beach front communities. I've met a staff that many I'll keep in touch for years. I've learned so much about communications and got my first glances into the world of marketing. Though limited, the kids I've worked with for AABH have been so much fun and I'll be sure to go back and visit the Treasures of Spectacle Island again and again. Save the Harbor/Save the Bay has giving me one of the toughest summers of my life, being away from what I've known all my life, but also has given me one of the best summers of my life. I feel that they have given me a new family - a family that is close by - much closer then New Jersey. I couldn't be more thankful for the opportunity that Save the Harbor/Save the Bay and the staff have given me. I've had an amazing experience and I hope that we all stay in touch! 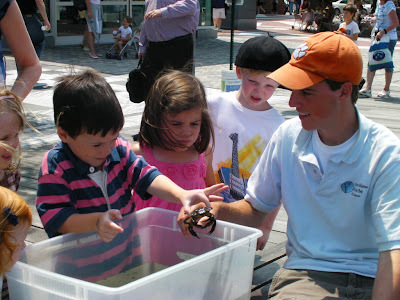 Throughout the summer of 2010 I had a terrific summer teaching the participants at the Boston Children's Museum about marine life in Boston Harbor, specifically the Fort Point Channel. 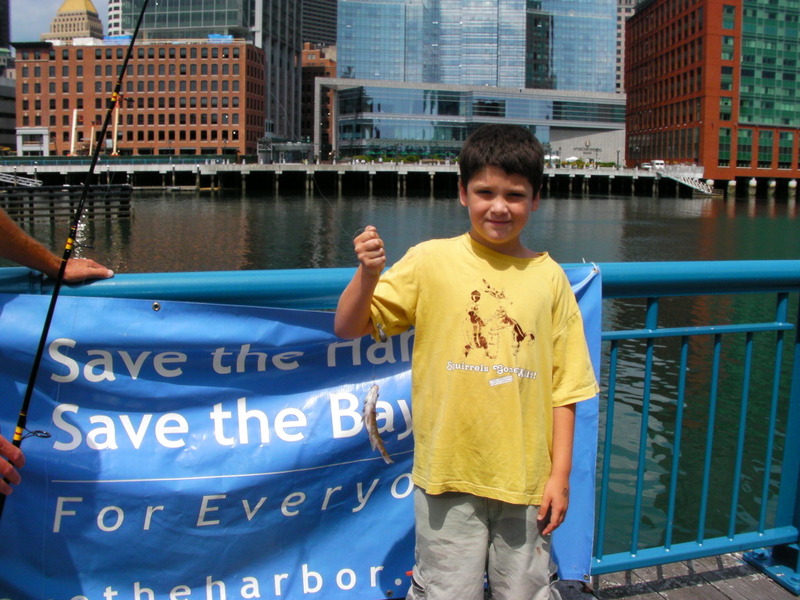 Every Monday, Wednesday and Friday the Save the Harbor staff taught over 600 participants from families to camp groups and BCM staff about marine life in the Fort Point Channel. - only one sea creature, LOBSTER. That was all we needed that day! - watching the Save the Harbor staff make strides in their teaching practices. - passing on my knowledge to the participants around us and they then transferred it to their parents and other children! - catching a fish in the crab trap! - Talking with parents about the strides Boston Harbor has taken and all the exciting events in and around the harbor. The Boston Children's Museum is a great place to meet marine life. Thank you to all the participants who helped fill our touch tank with various sea creatures. This summer definately ended with a bang. I had so much fun today, finally able to relax and enjoy the perfect day. After listening to the orientation led by David, and mouthing along to all the words, we left about thirty minutes earlier to get to the island. We all ran off to the beach with all the glass and in no time found 3 marbles, huge peices of red beach glass, two peices of ORANGE, and of course, a lot of pottery. Eating my last lunch with Cassie, David, Aruna, and Alizee, it suddenly hit me that summer was ending and I wouldn't see these wonderful people until next summer. I was determined to make the best of that day. We had a lot of fun bonding and joking about everything. On the way back to Boston, Lucas from the East Boston YMCA began to talk to me about how he remembered me and we played lots of games. This summer has been one of the best so far and I'm happy that I met all the new staff and getting to know them better as the summer passed by. I'm going to miss everyone so much! Thank you for the hard work and life long memories! Thank you to all the staff, campers, and participants at Piers Park Sailing Center, Courageous Sailing Center, Camp Harbor View, Boston Children's Museum, Harry McDougough Sailing Center, Black's Creek in Quincy, and the Save the Harbor/Save the Bay Staff. You have all reached out to over a thousand youth throughout the city of Boston. 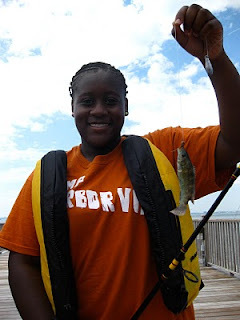 Many of the participants of Boston Harbor Explorers, All Access Boston Harbor, and Fishing 101 were able to fish, sail, boat and explore Boston Harbor for the first time, creating life long memories. Although I spent half of the summer in the office managing the programs, the times I spent at the sites made it all worth while and unforgettable. Every child had a smile on their face as they investigated the waterfront. From crab challenges to the first fish caught bragging rights, the summer was a success for all. This summer Save the Harbor/Save the Bay reached over a thousand youth in and around and for many it was their first time fishing, boating, and exploring the waterfront, where life long memories have been created on the Boston waterfront. As the summer comes to a close, the memories and experiences we have all created for the families of Boston and the staff around us will be passed on. As I head back into my high school classroom, where I teach Biology, I will bring my experiences you have all helped create into the lives of many more students. I hope that you continue to spread the experiences you have had with those around you. Everyone deserves to enjoy and share the waterfront. Thank you for sharing summer 2010 with us and we hope to see you on the docks, boats or at the pier next summer. Yesterday, I finished my goals from the beginning of this summer. It was also my first time going to the Courageous Sailing Center in Charlestown. After helping out at All Access in the morning and hugging Carolyn goodbye :'(, I went back to the office to go to Charlestown with Emily. Going through many changes and using most of the different colored trains and buses in Boston, we ended up in Charlestown, ready for another exciting day. Emily gave me a quick run down of what to do and what was going to happen during the day. When I heard that we were going to go sailing at the end, my face suddenly split into a wide grin... I was going to finish all of my goals! 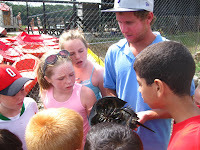 The kids in Step 2 were the first that we worked with and we all went down to the pier to pull up all the lobster traps. Pulling them up was really easy, but one was so stubborn! I tried to help two kids pull them up, and in the end, our efforts prevailed. We had many crabs and even a baby lobster! That took the entire time slot with the Step 2 kids, and it was now time to get ready to sail with the Step 3 kids. Emily told me that we were going to be on the green boat and will have a lot of attention of the two kids we were going to go out with, Gabe and Izzy. I was slightly nervous about this, but still stepped onto boat 7. Listening to the 11 year olds yelling "Jibe!" and "Tack!" made me astonished to see how mature the two were. Gabe wanted to fish off the back of the boat and left me to man the station. I quickly learned and helped them tack and jibe like a pro (hopefully). Emily talked about the Arctic terns a lot and how they came to Boston from the Arctic. Also, after talking to Gabe for a bit, I learned that he was going to go to my school in September in seventh grade! It was so much fun having my hand trailing in the cool water just inches besides me, the wind blowing on my face, the sun beating down on me, the tiller waving back and forth right above my head. This made me realize that I always want to be near the water and to go sailing as often as possible! Looking back, I've noticed that my blogging naturally reflects the focus the work we do: the kids! And I try not to embarrass the junior staff too much by singing their praises too loudly—but you can see from their own blog posts how much they do here, and I bet you can imagine how much fun they are to work with—not only that, but as the summer wears on I find (as Michelle and Jen have written), that they take on ever-more leadership and provide real support for the campers, for each other and for me. But I realize another, less visible relationship that’s critical to the work that we do: the interactions with partner organizations peppered through each day. Let me give you a few glimpses. The counselors at “Let’s Get Moving” got so into our name-games that the kids (who they have much longer-term relationships with than we do) couldn’t even begin to be shy—the result was lots of laughter, and some of the best sea-animal impressions I’ve ever seen! 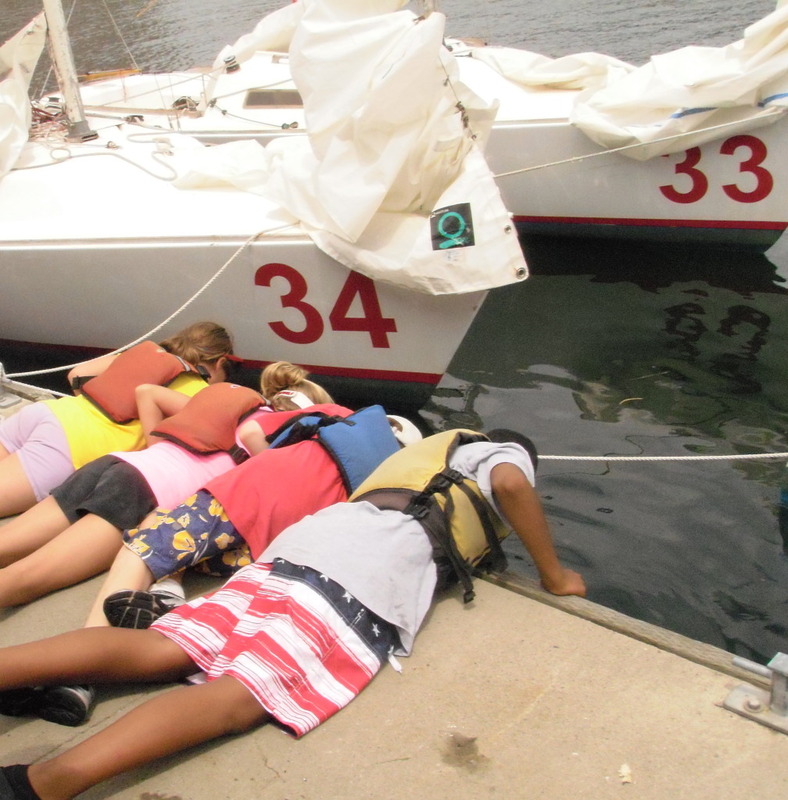 After helping us on the Green Boat at the beginning of the week, one sailing instructor told me she’s been passing on the knowledge she gained to the adults she teaches in the evenings—and that they are almost as interested as the campers! One stormy day this week one of the counselors at Courageous came up just to tell me how much the kids and counselors appreciate the lunch-hour harbor explorers program we run in Charlestown—he said some of the kids are as excited about exploring the marine life on the docks as they are about sailing off of them! The kids are why I come to work each morning, but the grown-ups who support them—my co-workers included—definitely brighten each day and remind me why it matters. Today I finally got to go on All Access and it was even more fun than I had hoped it would be. We got half of the kids from the Bank of America pavillion then picked up the other half from Piers Park. Some of the kids we picked up from Piers were ones I had worked with earlier in the summer, and I was very excited that they all remembered me. I also met some new kids who I have not worked with and they were very nice as well. And we even saw Denise's younger sister Dalia (she sounds exactly like her older sister lol). When we reached Spectacle Island, we all split into smaller groups. Alize, Caroly and I took a small group hiking to the top of the Island. We came back and had enough time to take a quick swim. I was having so much fun that I hadn't even noticed that it was time to go, I would not have objected to statying an extra hour, but sadly we had to leave. The boat ride back was also fun, I took the time to dry off in the sun, as I did not bring a towel. It was a very fun work day; Can't wait to go back on Thursday! p.s. Bye, Carolyn, was fun working with you finally. First Time Holding a Crab! 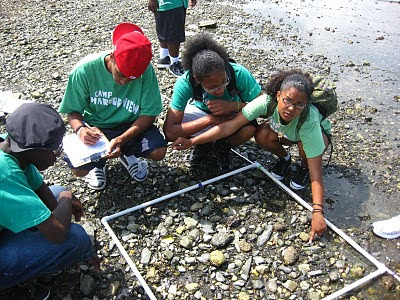 Each summer Save the Harbor / Save the Bay's gives thousands of young people from across the region a chance to spend the day in the Boston Harbor Islands National Park. 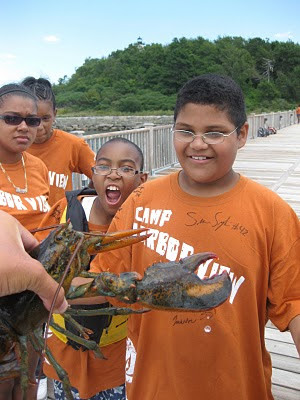 Since 2002, their free summer youth environmental education and recreation programs have connected nearly 50,000 young people aged from 7-17 – from 130 youth and community groups - to Boston Harbor, the waterfront and the harbor islands. 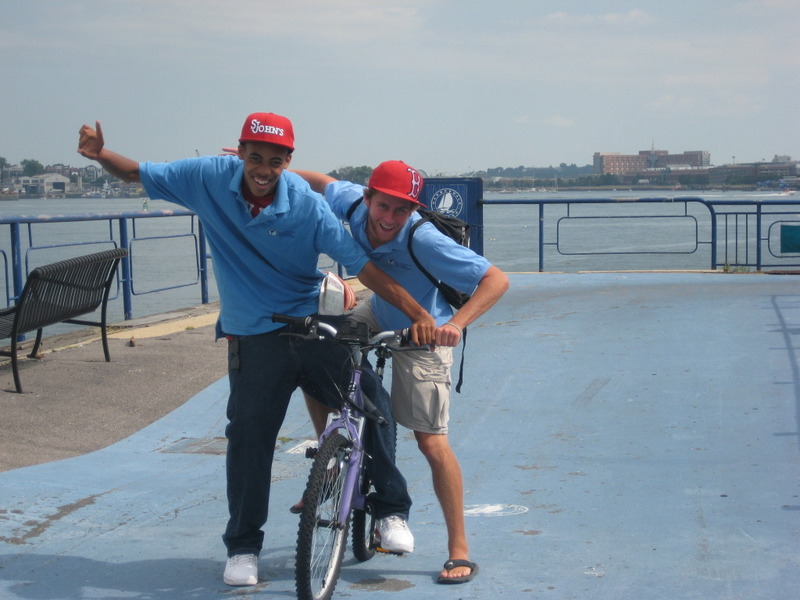 This summer Save the Harbor has added a new twist to the program - a treasure hunt on Spectacle Island. Spectacle Island served as a dump for municipal and household trash until 1950, and more recently as the disposal site for fill from the "Big Dig" before being transformed into a park. Today Spectacle Island is one of the most popular destinations in the Boston Harbor Islands, with a great swimming beach, walking trails, a visitor center and a terrific new snack bar - run by noted Chef Jasper White. "There aren't any pirates on Spectacle Island today, but there is lots of buried treasure" says Bruce Berman, spokesman for Save the Harbor / Save the Bay. "If you look carefully you can discover a lot about Boston's history - and have fun looking for sea glass and pottery shards on a beautiful island beach. It is a remarkable window into the past - and a great place to spend the day." "Who doesn't like to comb the beach and speculate where it all came from?" asked Pleun Bouricius, of Mass Humanities, who helps fund the free program on Spectacle. "What did garbage look like 50 years ago? How did this get here? What will happen to our garbage? Will it look like this 50 years from now? These are important questions for kids to ask and to answer." Maritime historian David Coffin who leads the island program for Save the Harbor, never tires of for searching for sea glass, pottery and other historic artifacts on the beach at Spectacle. “There is so much sea glass and pottery on that beach that you can actually hear it tinkle in the surf. " says Coffin. "It is a great way to learn about our past - and about our responsibility to protect important archaeological sites like this." 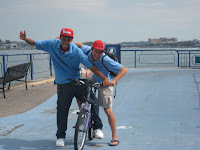 Save the Harbor / Save the Bay's free "All Access Boston Harbor trips" run three days a week from the Bank of America Pavilion on Boston Harbor, alternating between Spectacle Island and Georges Island in the Boston Harbor Islands National Park. On Georges, the kids can explore historic Fort Warren and search for the ghost of the Lady in Black. On Spectacle, youth and teens can hike, swim, fly kites, or search for buried treasure while learning about the harbor and our history. Save the Harbor / Save the Bay's youth programs are made possible by the generous support of: ABCD Summerworks, Arbella Insurance Group Charitable Foundation, Inc., Bank of American Pavilion/Live Nation, Clinton H. & Wilma T. Shattuck Charitable Trust, Connors Family Office, Dolphin Trust, Elizabeth Elser Doolittle Charitable Trusts, Forrest Berkley & Marcie Tyre Berkley, Friedman Family Foundation, GDF SUEZ Gas NA LLC, JetBlue Airways, John Hancock Financial Services, Inc., John S. and James L. Knight Foundation, Massachusetts Bay Lines, Mass Humanities, Massachusetts Port Authority, National Grid Foundation, P & G Gillette, State Street Foundation, South Boston Community Development Foundation, William E. & Bertha E. Schrafft Charitable Trust, and Yawkey Foundation II. Greetings from the dwindling days of summer programming... I'm heartbroken to see some of our youth staff's final blog posts already! But despite the fact that I've been carrying a light jacket around this week, our youth programs are still going strong, or, in the case of Blacks Creek in Quincy, ending on very strong notes. Tuesday afternoon, the staff and families of Blacks Creek gathered together to celebrate a successful summer at the William F. Ryan Boating and Sailing Center , and Save the Harbor / Save the Bay was honored to be a part of it. I was there with Aruna and Shaunae-- the three of us representing our entire staff's love of working there this summer. 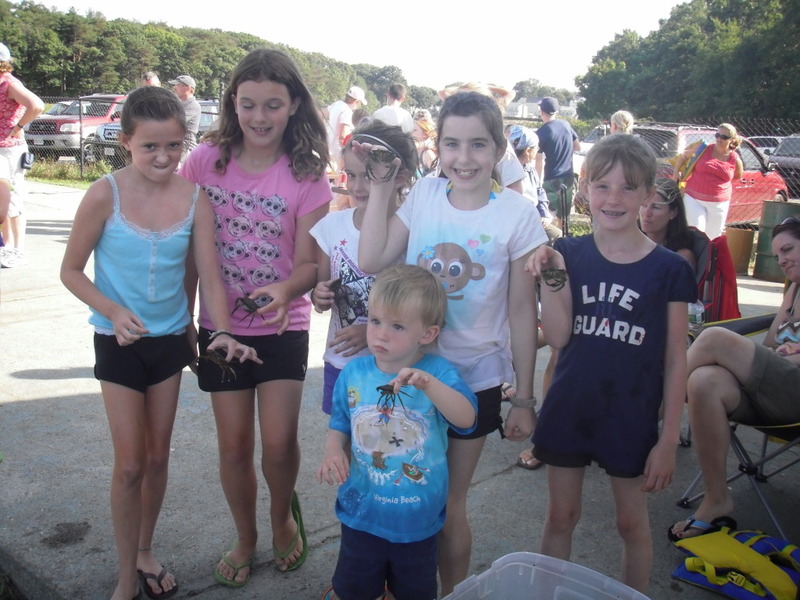 The event was a great chance for the kids at Blacks Creek to show their parents everything they learned this summer, be it sailing, kayacking, rowing, or all the knowledge they gained about all the critters that live in our Harbor. Plus, my family is very important to me, so I love seeing others in the context of their familes, especially the adorable kids I've been teaching at Blacks Creek! One of my favorite moments of the entire summer thus far was when Maria, one of Blacks Creek's many enthusiastic Harbor Explorers, gathered an audience of several mothers around the green crab in her hand and started explaining, 1. the difference between a male crab and a female crab, 2. how to hold a crab so it won't pinch you, and 3. hold to identify a green crab even if its orange in color. I couldn't have been more proud as she explained, "You have to count these 5 spikes next to its eye. And there are 5 letters in the word "green" so you can spell out G-R-E-E-N!" It was so rewarding not only to see that Maria had absorbed this knowledge, but that she had mastered it enough to pass it along to others and foster even greater Harbor stewardship in Quincy. As cliche as it may sound, I saw a seed of knowledge get planted, grow, and branch out right before my eyes. If I had any doubt before that I want a future in education, I don't anymore! Thank you to the Blacks Creek families for a great afternoon, and thank you to William F. Ryan Center for an incredible partnership this summer. I kept hearing from parents that their children had a great time in the Harbor Explorers camp, and I know that was a collaborative effort of our entire staff being rotated through all summer. Every one of us had a hand in making the summer a success. I'm extremely happy to have been a part of not only these past 6 weeks in Quincy, but of the afternoon that celebrated them as a community. Thanks again! I was the first of the Save the Harbor staff to arrive at Piers Park Sailing Center this morning. I got there just as the first campers were showing up. After Mark arrived I soon found out that we had to work the whole day without a Senior Marine Educator. At first I was a little bit worried but I knew Mark was up to the challenge so I manned up and got ready. We started off the day with a rousing game of sharks and minnows. Just as we were about to start another game I noticed that the kids were itching to get down to the dock. I grabbed the stuff while Mark led the kids down onto the dock. Although most people would say catching a striped bass from the dock at Piers Park, I beg to differ. 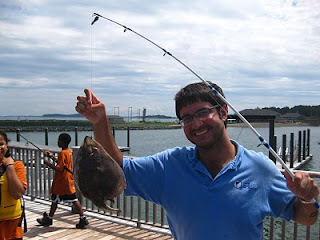 Hooking a crab is nearly impossible, for unlike fish, the hook does not actually hook through the crab. 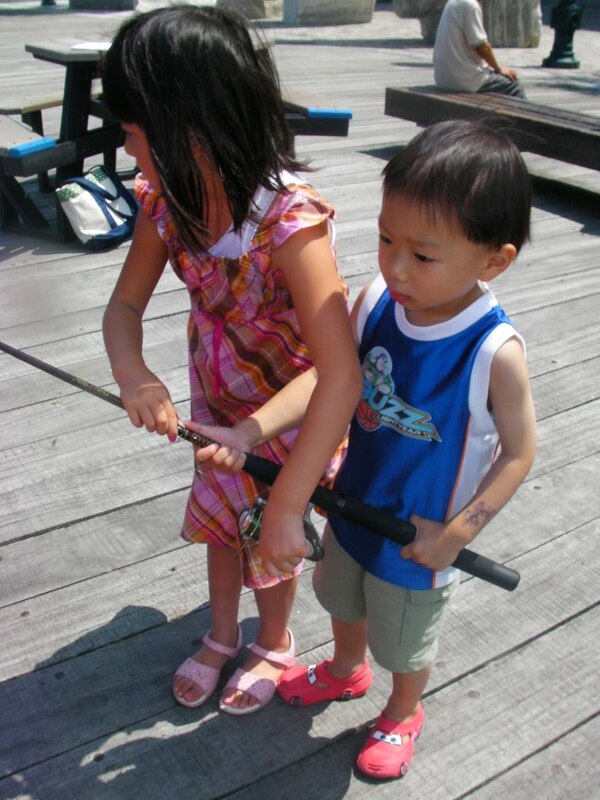 The angler must reel in his/her line at an easy, constant rate so the crab does not fall off the hook. We lost multiple crabs today for that very reason. After putting that disappointment behind us, Mark and I scooted on over to the Courageous Sailing Center at Charlestown. Mark and I set sail on the Green Boat with Kathleen the instructor, Norah, and Naomi, who are both Step 3 sailors. While we explored the Boston Harbor we ran some scientific tests on the water. To start things off we checked the temperature of the water. Our thermometer read 15 degrees Celcius, which, with the help of some speedy calculating on my part, we found out is approximately 49 degrees Fahrenheit. I can tell you earnestly that I had no plans to jump in the water after that. Next we checked the pH level of the harbor water in several different spots. Using simple pH strips, we found that the pH level was between 7 and 8, making it slightly basic. Usually, ocean water is about 8, which fit with our data. After these exhausting scientific experiments we decided to relax a bit and enjoy the breeze. Today was my last day of work which I spent at Courageous Sailing Center Dorchester. I spent most of my time playing football with the kids. The only part that wasn't really any fun was getting the ball thrown into the water, but it was eventually retrieved. I had a great time throughout the summer at many different sites, and I appreciated the help some more experienced staff gave to me. 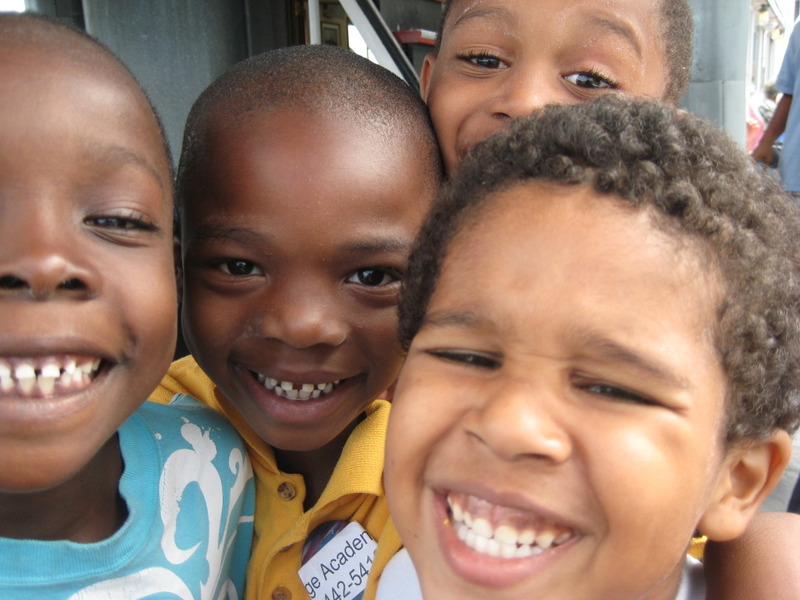 I learned not only about the harbor, but about the kids, which to me is the most important part. Even on my first day I had no trouble fitting in with the staff. Today was my last day of this summer, but I hope I will have the chance to have many more Save the Harbor days! Today was another eventful day with All Access. 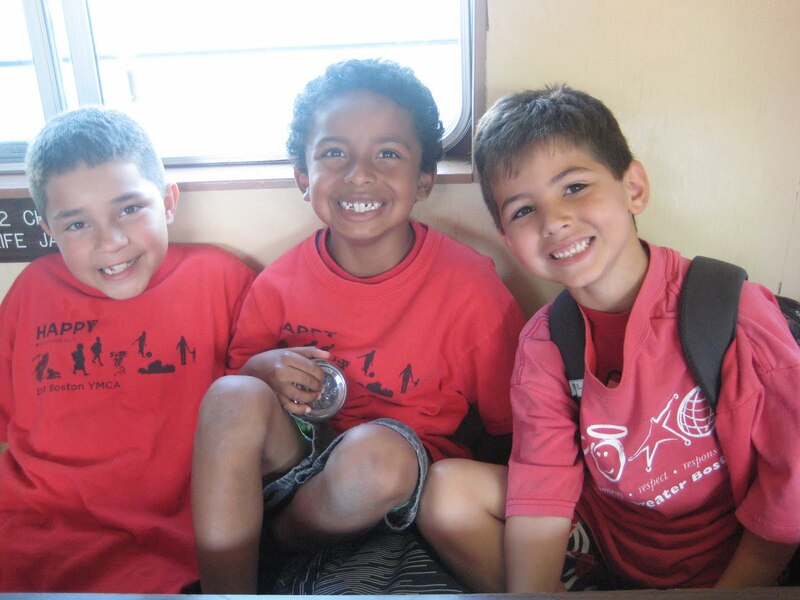 The staircase on the boat was crowded by small campers eager to explore the island when Bruce called me. I got off the boat running, trying to catch up to Bruce and Patty as they were already walking down the path towards the beach. I slowed to a jog when I neared the group who was listening to Bruce talk about the treasures, breathing hard. Soon after I arrived, we all went down on top of rocks onto the beach with the plentiful beach glass. We started the fun when we all lined up horizontally (and not holding hands - what a downer...) and had a race as to see who could collect the most interesting sea glass. I was apprehensive when we started walking along the beach. I quickly spotted green and white and brown beach glass, seeing how they were the most common. But I kept walking in a straight line, according to the rules. I picked up a cerulean colored one, a blue one, three green ones, and...... THREE PIECES OF RED BEACH GLASS! Although small, they are considered as the second rarest of all sea glass. 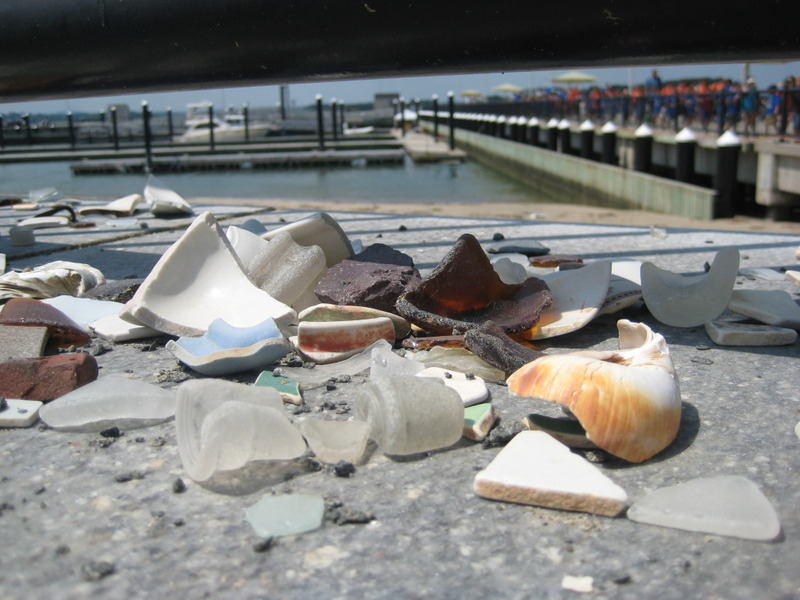 Read beach glass is usually found in car brake lights, the lights on the starboard sides of boats - warning lights, lanterns, and stained glass. I can't wait to see what I find next week! Hey boys and girls, I'm writing to you about our exploration of Spectacle Island on Staff Day. Our bosses Bruce and Patty brought us out to this Boston Harbor Island to have fun in the sun. After an intense game of capture the flag and a foot race with Cassie, where I destroyed her........by a lot, we all headed down to the beach. I had previous experiences beach combing but this island amazed me. There was just so much history scattered around the shore that we all became fascinated with finding the most unique object strewn on the beach. Bruce issued a challenge that were supposed to fan out and search the beach, yet, we could only carry two pieces at a time. Amongst everyone, we were able to find a wide range of interesting stuff. Due to Spectacle Island's past, it was a dump for Boston's trash for many years and it was the site of a horse rendering factory before that. It was because of this history that we found tons of sea glass, pieces of porcelain, old horse bones, parts of old sinks, perriwinkle shells with wholes punched in by moon snails, a marble, and a tiny plastic shovel. It was crazy that there is such a wide variety of interesting treasures that one can find on the beach, one just simply has to look for it. Yesterday was the last day at Blacks Creek for the summer, and I'm glad I had the opportunity to be there on that day. Michelle had this awesome plan to get the families at nautical to go on a scavenger hunt for things we have been catching at the site all year long. Unfortunately, we arrived there only to find the tide super high, the highest it has been all summer long. with the beach gone and no where left to search for critters, we had to come up with a new plan. We set up a crab trap on the dock and caught a ton of green crabs in no time with our hot dog bait. 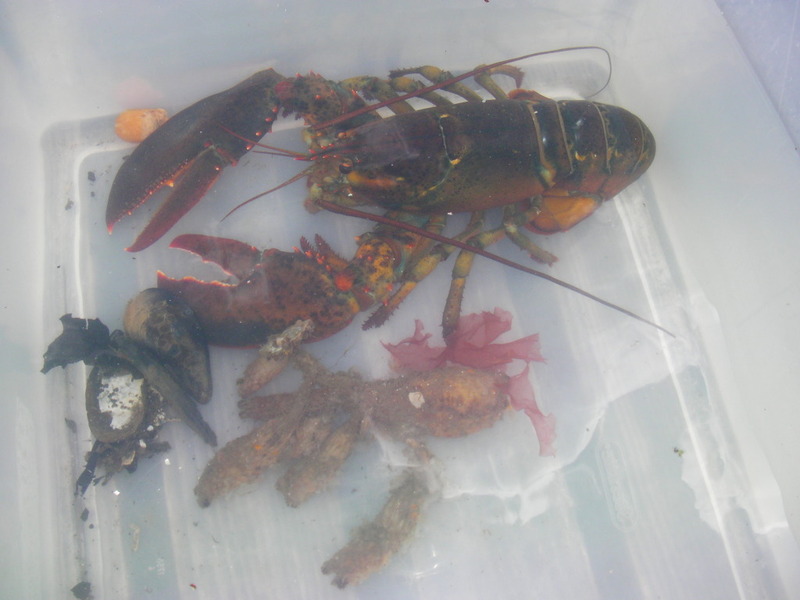 With that, we set up a touch-tank and attracted a lot of interested families. A couple of the girls we had been working with since day one, Maria and Rachael stuck around the entire time. We also had a few younger kids, hopefully future campers, that hung around with us for a while. One of then was 4 year old Matty, he was so brave. It was a great last day at Blacks Creek, a lot of the parents came up to us and thanked us for giving their kids a great summer. The kids were all amazing at blacks creek, and I hope to see them again next summer. On staff day we went on a trip to spectacle Island. When we got there, there was a little debate about what game we were going to play. We eventually settled on playing capture the flag, and it proved to be a good choice. We played to games of capture the flag, the first of which only lasted a couple of minute. The second game was a little more fun because it lasted longer and involved a bit more strategic work. When Patty and Bruce arrived on their boat with food, we made our way quickly to the dock and had a good time. There were lots of hot dogs and steak, as well as a lot of my favorite fruits. After eating and relaxing, Bruce asked us to go on a treasure hunt along the beach. We found a lot of interesting sea glass and pottery. My favorite find was the marble, it was pretty cool, not something thats easy to come across.